So you’ve got a dinner party coming up and you need a break from traditional hors d’oeuvres. Try something that will knock peoples socks off! Beef Jerky is probably something that makes the list of “common” hors d’oeuvres but it should. If you’re thinking OMG – I can’t believe these rednecks are suggesting this … stop and think for a second … if you were going to serve chocolate chip cookies for dessert, you probably wouldn’t get “Chips Ahoy”, would you? You’d bake up a fresh batch of cookies and serve them while they’re still warm, right? Why should beef jerky be any different? And it’s easier to make than chocolate chip cookies … Win/Win right there. • Procure 5 pounds of lean beef rounds from the butcher shop or meat market. Lamb, pork and chicken work great too – the key is to make sure they are as lean as possible. All fat must be trimmed completely from the meat block. • Second, get the meat cold. Very cold. Slightly frozen is perfect, but not so frozen you can’t cut it. • Slice the meat, across the grain, into 1/4” – 3/8” thick slices. As you cut the meat, it will thaw and soften up a bit. • Next, mix the meat with the marinade and put it in a large Ziploc bag and let it set for 24 – 36 hours. 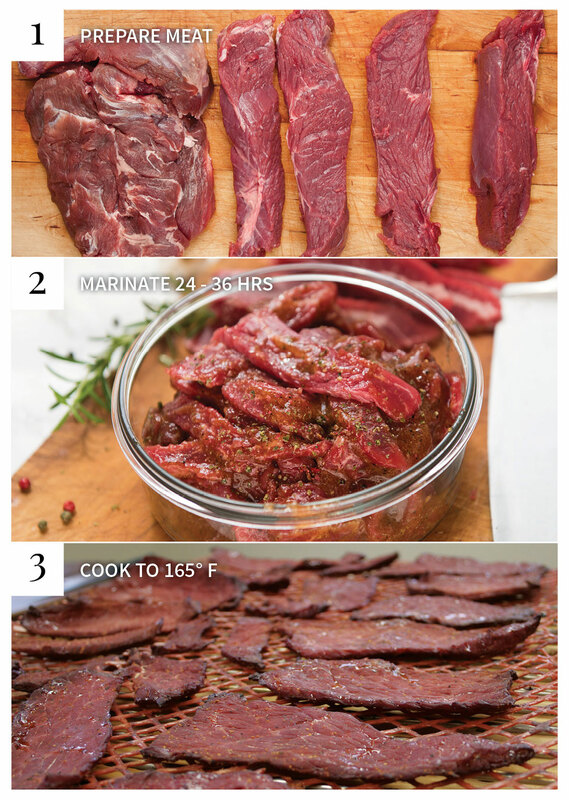 Making uncured jerky- the rest time prior to cooking is less critical, as the time is designed to allow the cure to fully penetrate the meat. (cured jerky will keep for weeks in the refrigerator, uncured will keep for a while, but not as long) For fresh jerky hors d’oeuvres cured jerky isn’t as critical. Once the meat has had a chance to marinade, lay it out on a drip rack on a cookie sheet. Do your best to lay it out so that no two pieces are touching. Now you’re ready to cook. Set your conventional oven to 185° F (or it’s lowest setting above 165° F). Leaving the top of the door cracked to promote convection, allow the meat to cook until the internal temperature reaches 160 – 165° F. The great part about this jerky is that it can sit in the oven at the low temperature until you’re ready to serve, which gives the host or hostess the opportunity to have some flexibility of schedule. Results are amazing, better than any store bought jerky you’ve ever eaten.